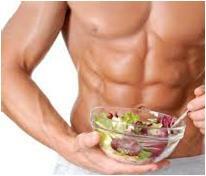 There is a single human study that would suggest that forskolin would make you get closer to this classic physique w/out tons of salad (who said that's necessary anyway?). Since Maxim asked in one of his more recent comments about the usefulness and/or downsides of forskolin, I dediced to dedicate this Sunday (finally again?) to answering a user question and am going to briefly sum up some older and the few novel findings on forskolin I am aware of. For those of you who find that boring: Don't blame Maxim alone, another reason for this decision was that I have seen discussions on forskolin resurface elsewhere on the Internet. By the way, I write re-surfaced, because forskolin has once been hailed as a testbooster and fat loss adjuvant, but as the prices increased and people came out with faked or low-quality products that did not yield results, the market collapsed. What is forskolin and where does it originate from? As usually there is more than a single answer to this question. The most straight forward general ones are probably (a) it is a white to white with yellow cast powder, or (b) a labdane diterpenoid with antihypertensive, positive inotropic, platelet aggregation inhibitory and adenylate cyclase activating properties. Moreover, forskolin is able to activate the adenylate cyclase and thus increase the intracellular cyclic AMP levels in most tissues and cells. And hat it's called forskolin, because it is derived from the Indiant plan Coleus forskohlii is probably something 99% of you knew already. The reason I suppose that Maxim got interested in it, is that it is commonly used in cell studies to raise the levels of cyclic AMP (cAMP; cf. Alasbahi. 2012) and did a pretty impressive job in the recently discussed PGC-1a study. On the other hand, it did also increase the expression of the aromatase enzyme in the Yang study mentioned in the "Natural Sildenafil & Testosterone Alternative" post on which Maxim replied with the initially mentioned comment. I know that sounds confusing, but in essence forskolin does nothing but increasing cAMP levels in almost all types of cells. cAMP a breakdown product of ATP (=> cAMP => AMP) in turn is one of those molecules which exert most their effects as intracellular signal transducer. 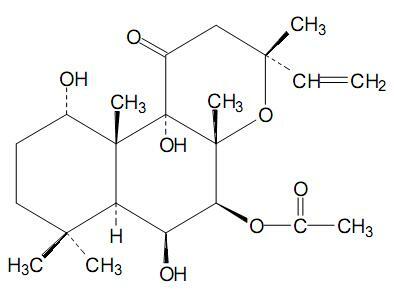 In that, it is involved in the activation of protein kinases and regulates the effects of adrenaline and glucagon. It also modulates the calcium channels and contributes to growth hormone release; unfortunately, cAMP has also been implicated in the proliferation of not very beneficial cell growth aka cancer. The same ion-flux mediation has recently been implicated in the etiology of ADHD, as well (Arnsten. 2012). On the other hand there are a handful of benefits, e.g. In a 2005 study (Godard. 2005), which caused quite a stir in the health and fitness community back then, Godard et al. observed profound beneficial effects of testosterone and body composition (cf. figure 1) after the ingestion of 2x250mg of a 10% standardized forskolin (Forslean). 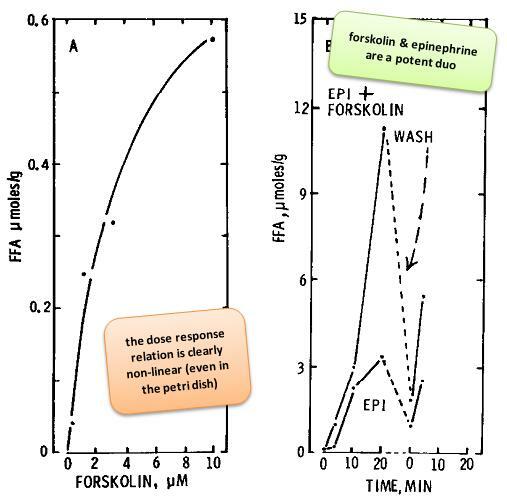 In several in-vitro studies, forskolin has been used as a positive control to compare the effects of other compounds on the testosterone release in leydig cells. Lin et al. for example used it in 2001 as a comparison for lactate and found a ~3x increase in testosterone release in incubated leydig cells (Lin. 2001). A similar study by Yu et al. showed that the addition of green tea catechins lead to an additional stimulation of forskolin induced testosterone production in cell cultures (Yu. 2010). As part of a topical cosmetic slimming product combining tetrahydroxypropyl ethylenediamine, caffeine, carnitine, retinol and, obviously, forskolin it has shown some promise as a topical anti-cellulite and toning agent (Roure. 2011). The clinical study was however financed by Johnson & Johnson and I am not sure how much of the effects were actually brought about by forskolin (the placebo was a basic gel with the same texture containing mainly water, gelifying and preservative systems). So take the data in figure 2 with a grain of salt, ladies - I bet 12 weeks on this product are not going to be exactly inexpensive. If you add to this the host of wanted and unwanted, known and unknown side effects that occur in response to the coleus foskohlii induced cytochrome P450 modulation (e.g. 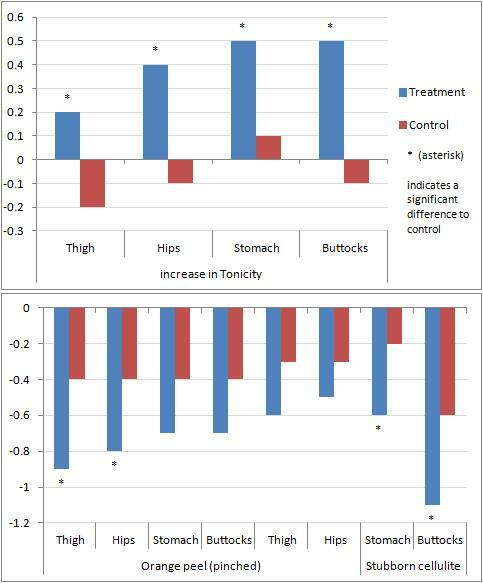 the mice in the aforementioned study by Virgona lost some visceral fat, but the costs were increased fat deposition in the liver and elevated transaminase levels). With the questionable "fat loss" benefits (remember stress is also a powerful lypolitic and the problem is not to get the fat out of the cell, but rather to burn it), and the almost non-existant human data on the purported testosterone boosting effects, this should be reason enough not to buy more than one bottle for a test-run. After which I highly suggest to do some lab work to see if whatever good or bad you believe you are feeling is an actual boost in T (check T-levels) or hepatic side effects (check ALT, AST & ALP). Arnsten AF, Jin LE. Guanfacine for the treatment of cognitive disorders: a century of discoveries at Yale. Yale J Biol Med. 2012 Mar;85(1):45-58. Epub 2012 Mar 29. Godard MP, Johnson BA, Richmond SR. 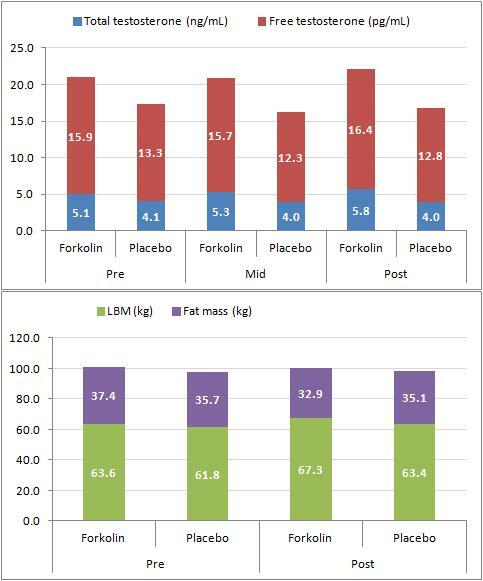 Body composition and hormonal adaptations associated with forskolin consumption in overweight and obese men. Obes Res. 2005 Aug;13(8):1335-43. Kobayashi K, Nishikawa M, Omay SB, Toyoda H, Deguchi K, Shirakawa S. Forskolin potentiates G-CSF-induced proliferation of a murine myeloblastic leukemia cell line. Leuk Res. 1994 Feb;18(2):111-7. Lin H, Wang SW, Wang RY, Wang PS. Stimulatory effect of lactate on testosterone production by rat Leydig cells. J Cell Biochem. 2001 Jun 26-Jul 25;83(1):147-54. Pescosolido N, Librando A. Oral administration of an association of forskolin, rutin and vitamins B1 and B2 potentiates the hypotonising effects of pharmacological treatments in POAG patients. Clin Ter. 2010;161(3):e81-5. 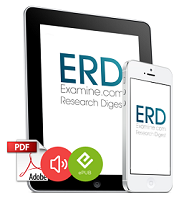 Roure R, Oddos T, Rossi A, Vial F, Bertin C. Evaluation of the efficacy of a topical cosmetic slimming product combining tetrahydroxypropyl ethylenediamine, caffeine, carnitine, forskolin and retinol, In vitro, ex vivo and in vivo studies. Int J Cosmet Sci. 2011 Dec;33(6):519-26. Vetrugno M, Uva MG, Russo V, Iester M, Ciancaglini M, Brusini P, Centofanti M, Rossetti LM. 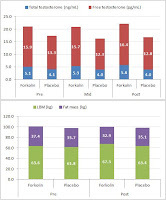 Oral administration of forskolin and rutin contributes to intraocular pressure control in primary open angle glaucoma patients under maximum tolerated medical therapy. J Ocul Pharmacol Ther. 2012 Oct;28(5):536-41. Virgona N, Taki Y, Yamada S, Umegaki K. Dietary Coleus forskohlii extract generates dose-related hepatotoxicity in mice. J Appl Toxicol. 2012 Jun 22. Yokotani K, Chiba T, Sato Y, Taki Y, Yamada S, Shinozuka K, Murata M, Umegaki K. Hepatic cytochrome P450 mediates interaction between warfarin and Coleus forskohlii extract in vivo and in vitro. J Pharm Pharmacol. 2012 Dec;64(12):1793-801. Yu PL, Pu HF, Chen SY, Wang SW, Wang PS. 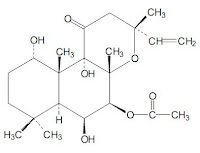 Effects of catechin, epicatechin and epigallocatechin gallate on testosterone production in rat leydig cells. J Cell Biochem. 2010 May 15;110(2):333-42.